Wildebeest on left. And stickers, always stickers, of course! My oldest grandsons, both five, are learning to make their letters. As a writer, I’m excited to see them enter the world of forming words and copying simple sentences. Happy Valentine’s Day card (where I supplied paper, envelope, stamp, and address sticker) and his mama supplied the “translation.” Love it all. 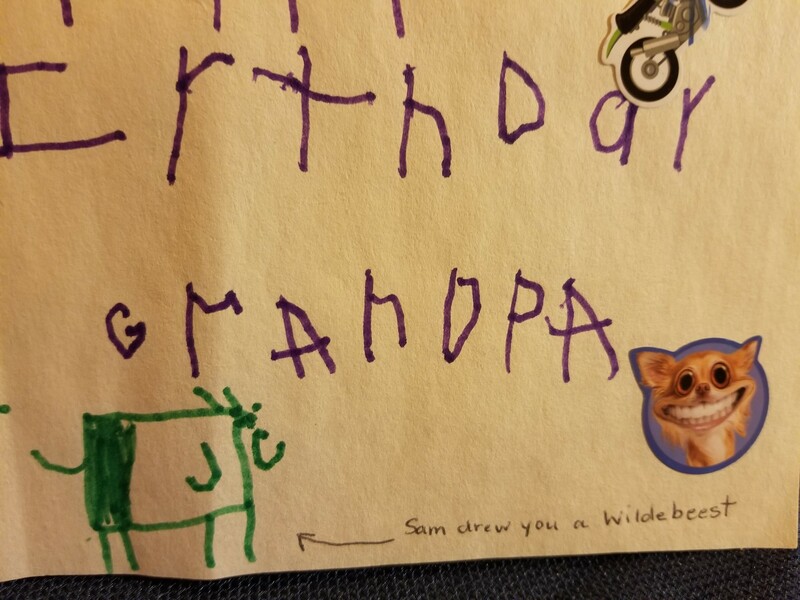 The oldest one sent his grandfather a birthday card this year that was hand lettered with a drawing he made of a wildebeest. I had also sent these boys, with their Valentine’s Day cards, letter writing supplies: paper, envelope, address sticker, and stamp to write back to us. 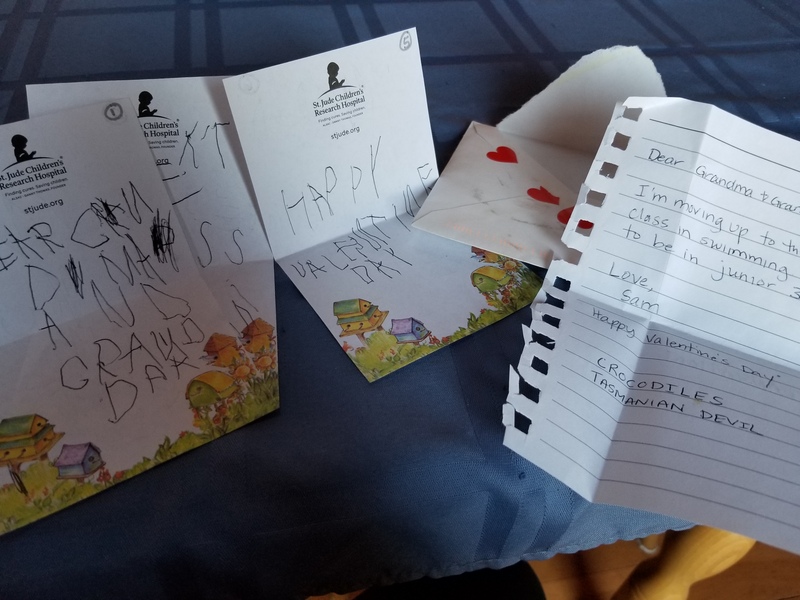 I have no hopes of them ever really using old fashioned letter writing communication to be in touch with us as they grow, but it doesn’t hurt to acquaint them with the practice. Friends with older grandchildren say they enjoy texting back and forth with their grandkids. 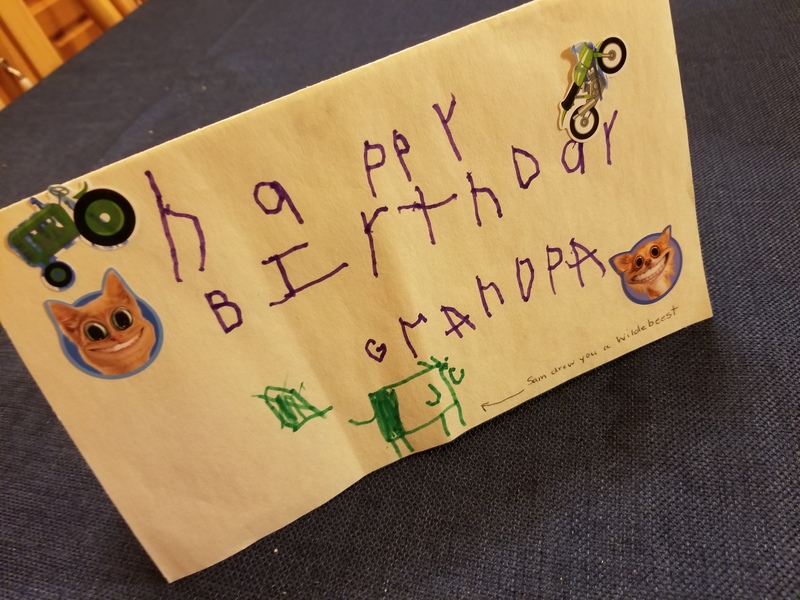 Not sure what the meaning of the wildebeest in the birthday card was (neither was his mother) other than that we had visited the zoo with their family last fall and had enjoyed seeing this somewhat unusual African animal. I also enjoyed making, for both sets of grandchildren, photo “memory” books from our experiences with them, with a small storyline. They loved the books. The oldest one has either memorized the text, or learned to actually recognize the words in the book from frequent reading, and can “read” it now to his little brother. I’m not one to push kids into reading, or academic rigor before they are ready. I remember our oldest daughter coming home from first grade asking us how Mrs. Proctor had been able to teach her to read. She called it “magic.” And in a way, it is. Michelle did not understand all of the work she had put into learning what sounds various letters make in words, how certain combined letters sound, and that some letters make no sound at all in some words. But all of a sudden, she realized she was reading books. Today she absolutely loves to read. But she didn’t do that automatically either. There was a time when she was not keen on picking up a book just for leisure reading, but then she discovered the Boxcar Children books at school. We went to the public library and she found even more. And she was off, reading forevermore. I’m happy to say all of our daughters are avid readers, as time allows. From Day One and before, our grandsons have been exposed to words, books, ABC’s, numbers, colors. They have been read to every night and naptime, and many times throughout the day as they want. We know that children who are not blessed with loving, attentive parents—especially those spending first months and years of life in an orphanage miss out on so much (as you might have read about last week in this column). Not only love, but hours and hours of hands on care and deep affection. Blessed are the foster parents and caregivers who share love, attention, food, and clean clothes with little ones when their birth parents are unable to take care of them for various reasons. But back to ABCs. I was interested to discover that teaching the art and skill of cursive handwriting diminished when “Common Core” curriculum standards were introduced a few years ago (which ignored handwriting, I understand). In recent years some states and locations have incorporated the teaching of cursive again. Never mind that many adults have trouble writing neatly enough to even decipher it, but most official documents still require a handwritten signature, rather than printed. For lovers of history, being able to read cursive may come in handy exploring historic handwritten documents. He did such a good job! So yes, read to children, read for yourself, share the love of books and writing and all the great information out there at the tip of our googling fingers. While worldwide literacy rates are rising, in many cultures little girls especially are not taught to read nor educated beyond the ages of 10-12. That is another tragedy I’ll write about in a future column. What a blessing it is to be able to read, write, and learn about the world. If you have a little one in your house, family, or neighborhood, I have a free St. Patrick’s Day Word Tracer worksheet to download and print, or write for. Here’s the for the PDF: word tracer_st patrick. To receive one by mail, write to anotherwaymedia@yahoo.com or Another Way Media, P.O. Box 363, Singers Glen, VA 22834. You can find more educational resources, at Education.com. How do you encourage reading and writing readiness in children? How long do you save cards? We recently recycled a bunch from my daughter and our own at a local agency, Pleasant View, Inc. which uses many resources for doing crafts with clients. Many retirement complexes also are happy to get them for craft and art activities. Plaudits to your grandsons and to you for posting this. It brings back memories of our grandchildren and their early language learning. I have saved some of their “cards” inside my map table and others on my blog. How long do I keep cards? Probably too long because I associate the card with the person kind enough to send it. When we moved, I tossed many; now they are starting to build up again. I’m curious to know what your map table is–sounds like a good place and I’m sure you’ve written about it before on your blog so I will look for it. It is very very hard for me/us–especially my husband–to part with dear cards from dear ones. I still have all the cards sent to us after Dad’s funeral over 10 years ago. But having a place for others to use them/send them helps me slowly donate them away. 🙂 Thanks for commenting! I’ll send you a photo in email. I don’t think I ever wrote about the map table, one of the oak pieces we stained and polyurethaned from a do-it-yourself shop years ago.